Like a lazy Ottoman pasha, Mt Lepetimnos stretches in the north musing over the island. His volcanic fire was extinguished long ago and today his coat is still dotted with some specks of snow. With his tops reaching for the clouds, he reflects the last sun rays and smiles you a welcome when you travel to the north of Lesvos. 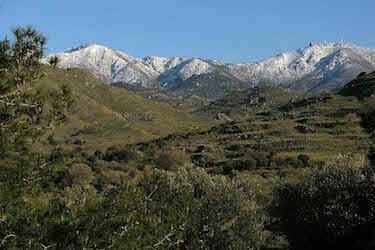 One of its tops, the Vigla, is, at 968 meters, officially the highest peak of the island. The story goes that Mt Olympus had the highest top, but due to the placement of military buildings and masts, the top was reduced by a few meters. From its highest ridges Lepetimnos offers spectacular views over a great part of the island as well as the faraway hills and mountains deep into Turkey. On clear days you may even see the islands Limnos and Ai Stratis and even Mount Athos on the mainland. On the flanks of Lepetimnos you can find an assembly of sleepy villages: Vafios, Argenos, Lepetimnos, Sykaminia, Kapi, Pelopi, Ypsilometopo and Stypsi, all dependent on the moods of the mountain. The village of Chalikos was banished when, around 1970, earthquakes and landslides made the houses uninhabitable. I wonder if the villagers called the new village, built on lower slopes, Lepetimnos in order to propitiate the angry mountain. The old volcanic giant was named after the groom of Mythimna (one of the daughters of King Makara); she gave her name to the little town now also known as Molyvos. We do not know much about their marriage, but Mythimna and Lepetimnos never lost sight of each other. It is Mt Lepetimnos, rich with sources, some even with hot water, that provides the little town with water. The Romans, always busy constructing bridges and aqueducts, even led warm water to Molyvos. Theophrastus wrote that on the top of Lepetimnos there was an observatory where the astrologer Matriketas of Mythimna observed the stars. The only thing we know of this scientist is that he worked at a height of 986m. Some say that he was just an ordinary weatherman. I can see the donkeys running up and down the mountain in order to give the latest news about the weather. Or was there a clever system with flags or fire signals, like they also used during the war of Troy? Mythimna always remained dependent on Lepetimnos. As a caring husband he provided her, not only with water and weather reports, but also with shiny metals and marble; some gold mines are still to be found on the mountain. He took care of green meadows and fertile ground where once masses of grapes grew, making the wine of Mythimna world famous. On the other side of the mountain the village of Mandamados attracts lots of tourists and pilgrims with its Taxiarchis Monastery. The old icon of archangel Michael (Taxiarchis) has been attributed with many miracles. In ancient times it was to the oracle here that people went in order to ask for healing, a victory or other wishes. Because Lepetimnos was a hero from the war of Troy, there was also a sanctuary in his name on the mountain, where it was the crows who had the power to predict. Around Kapi and Pelopi many archeological finds prove that even in ancient times this was a popular region, with many castles and temples. It is a pity that no archeologist has been doing thorough research on that site of the island. Any proof of a lively society will disappear slowly with the recycling of stones to build walls, stables, houses and roads. The region now is living mainly on cattle breeding and only a very few tourists know these charming villages which group around that site of Lepetimnos. The folds of the mountain (that can be explored by feet and even by car) hide many different and surprising landscapes: meters' thick plane trees along gurgling streamlets, sweet scented chestnut woods, tender green meadows, quiet and secret little lakes and on top a whimsical landscape with rough rocks where in spring blood red tulips flower. Century old foot paths slowly gaining height invite fantasies about what people could have passed there: was it the astrologer with his assistant, refugees looking for places to hide or couples making love in secret? If trees could talk, what a colourful parade of stories we would hear. For thousands of years this tamed volcano has lain on guard. He has seen the passing of the heroes of Troy, he has seen how a daughter of a king, in love with the hero Achilles, betrayed her besieged town Mythimna, by giving the key of the entrance to Achilles. He has seen Pelasgians, Aegeans, Aeolians, Lydians, Romans, Italians and Ottomans grab the power on the island. Recently the husband of Myhtimna again saw thousands of refugees stranded on its shores. Silently he is watching how desperately the islanders battle the enduring crisis. No longer does anyone climb its slopes, looking for a sanctuary where the gods can be asked for help. Water and grassy meadows are not enough anymore to keep the spoiled inhabitants of Mythimna happy. But this old, rich icon who each day again tries to catch the last sun rays, knows that for sure new times will come and that no crisis or war will separate him from his beloved Mythimna.